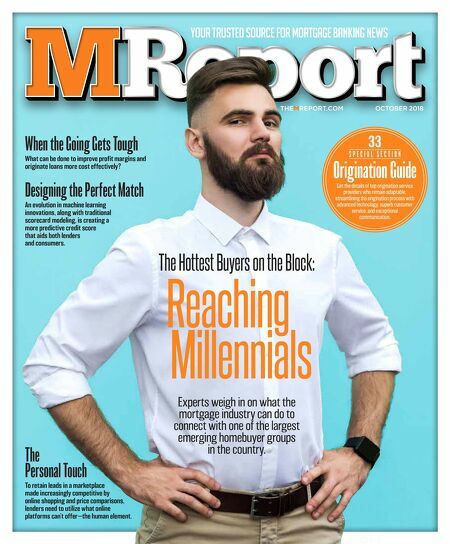 THEMREPORT.COM YOUR TRUSTED SOURCE FOR MORTGAGE BANKING NEWS OCTOBER 2018 The Hottest Buyers on the Block: Reaching Millennials Experts weigh in on what the mortgage industry can do to connect with one of the largest emerging homebuyer groups in the country. The Personal Touch To retain leads in a marketplace made increasingly competitive by online shopping and price comparisons, lenders need to utilize what online platforms can't offer—the human element. 33 S P E C I A L S E C T I O N Origination Guide Get the details of top origination service providers who remain adaptable, streamlining the origination process with advanced technology, superb customer service, and exceptional communication. When the Going Gets Tough What can be done to improve profit margins and originate loans more cost effectively? Designing the Perfect Match An evolution in machine learning innovations, along with traditional scorecard modeling, is creating a more predictive credit score that aids both lenders and consumers.